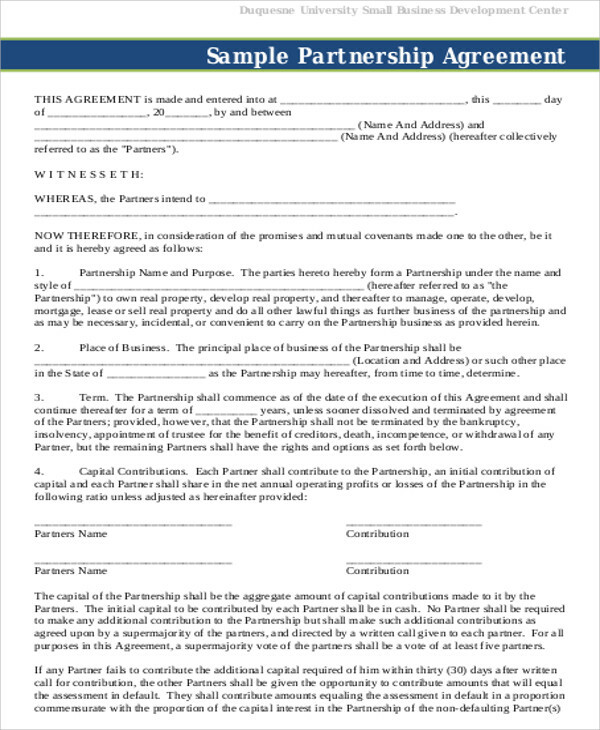 A partnership agreement contract may mean a lot of things with regards to agreement between partners. They could be a business agreement wherein two or more partners may form a business venture, a musical act such as a band that need to sign an agreement contract to keep the act together, or a marriage contract wherein partners—in this case a prospective husband and wife—sign an agreement that settles their respective rights and obligations under the agreement of marriage. Our website’s Sample Agreements all have examples of the above that users may use any of the samples that meet their purpose or will guide them in drafting their own agreements. These are all free to download and print. 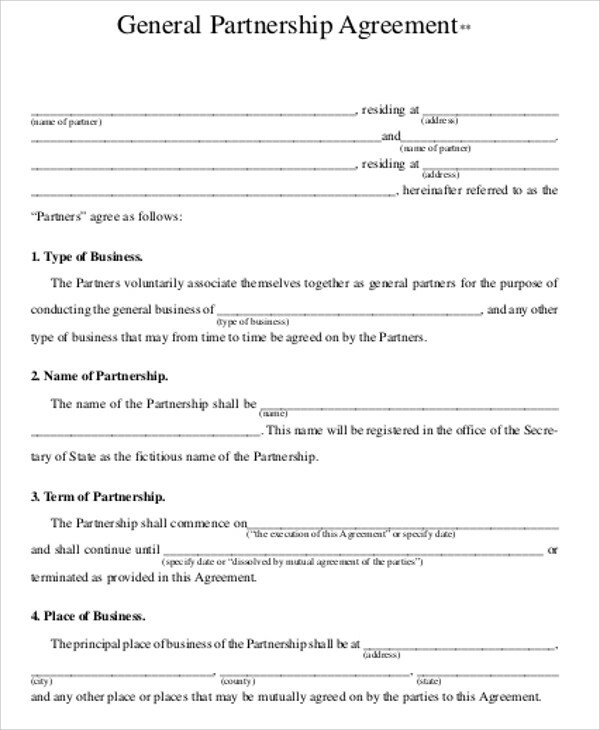 For business partnership agreements, it’s generally an agreement between two or more parties who share ownership of the business that is quite different from a corporation. A corporation has a complex structure that has several shareholders who decide the direction that the company is headed. 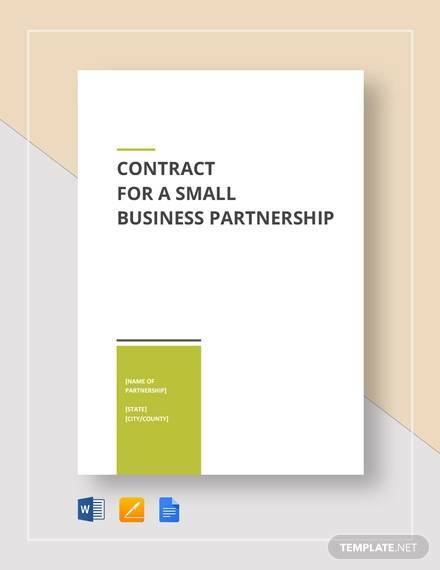 It has a lot of legal processes that are quite costly, that’s why most small to medium businesses prefer partnerships that are less costly and require little legal requirements. 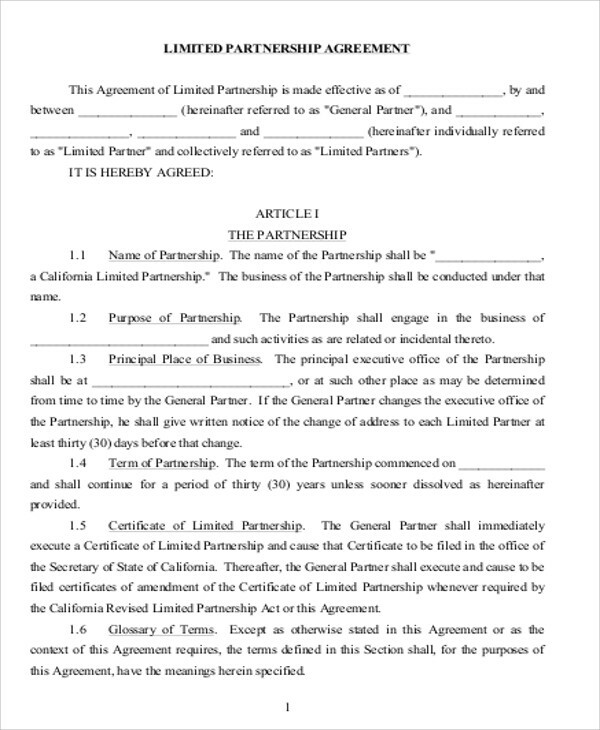 A partnership agreement may choose between two kinds of partnerships depending on the terms of their agreement. 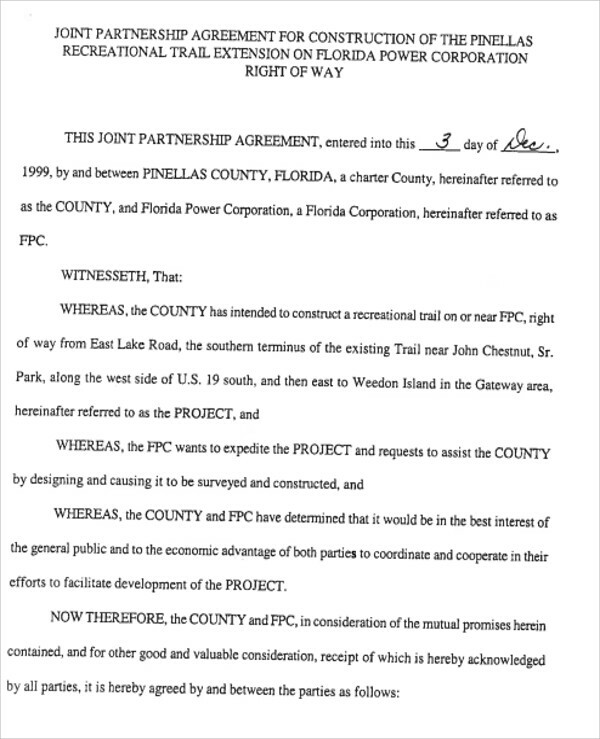 Limited Partnership Agreement – An agreement wherein some partners own and manage the company while the other partners serve only as investors and contribute to whatever financial requirements are needed. This kind of partnership will have been defined in the contract from the onset of the agreement where liability and profit-sharing are thoroughly arranged and mutually affirmed. 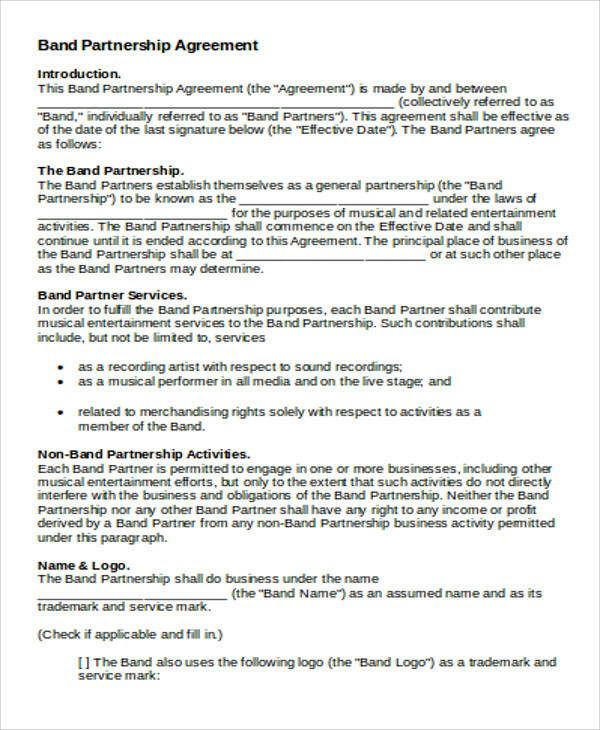 Another kind of partnership agreement found in our samples is band agreement. It’s an agreement between professional music acts who need such agreements between their fellow band members through their success or failures that may come their way. Before they become famous or get a big break by signing up to a major record label, most bands would not consider a band agreement. However, if the band suddenly becomes successful and money gets into the picture, the whole scenario may change. A business difference or career goal conflicts may come in the way of their partnership. Things like tax considerations, song copyrights, songwriter credits, and profit and loss matters need to be considered. That’s why it’s important to have a band agreement. 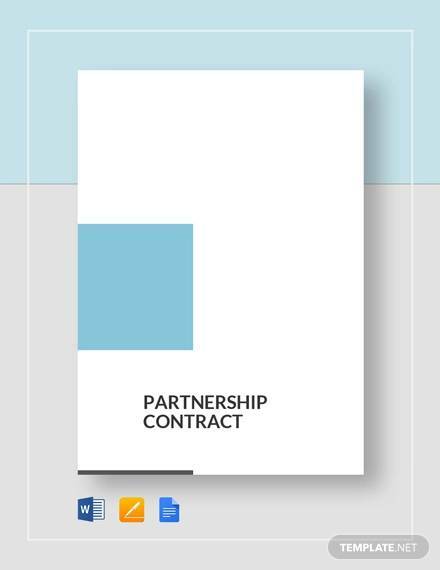 For more kinds of samples, please check out our Sample Contract Agreements and Subcontractor Agreements that can also be downloaded for free by users who may find these examples helpful for drafting their own contracts. 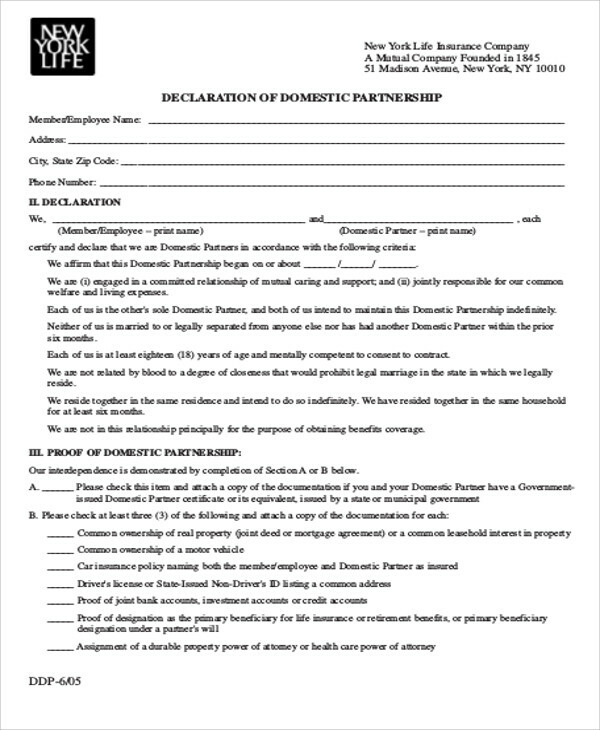 Perhaps the most famous partnership agreement contract known by a lot of people is a marriage contract. Marriage is a serious matter that warrants a contract that is legally binding. This contract is being made to ensure both couples have equal rights and responsibilities regarding financial support and child support in the event there will already be children that need to be taken cared of by both couples. 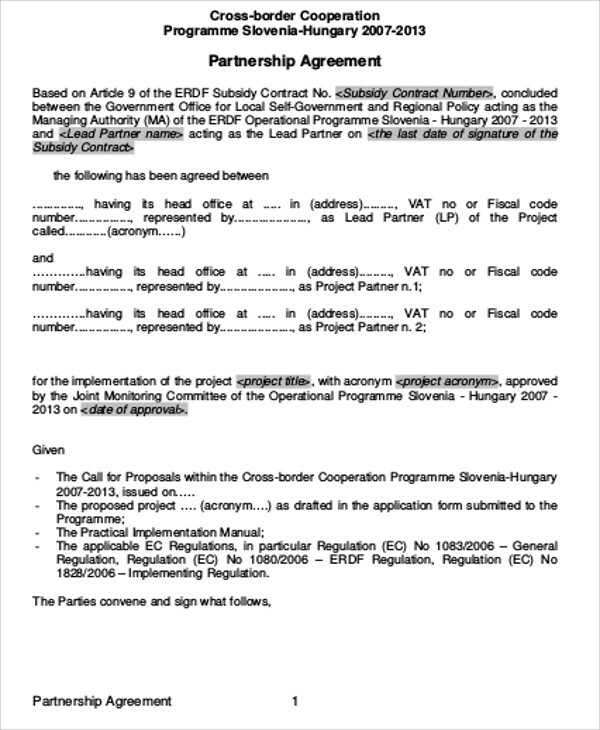 For other kinds of agreements, please check out more on our website or click on the link for Rental Agreement Contracts. These may be needed by both landlord and tenant who need to familiarize themselves with the terms of a rental agreement.